Okay, here’s a bit of an unusual review for me. The first real step in exploring Île de la Réunion was actually found in getting there. 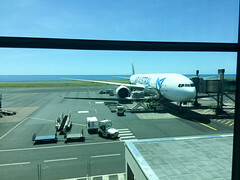 We ended up taking the mostly-unknown-outside-the-Indian-Ocean Air Austral between Paris and Saint-Denis, in a really long 11 hour direct flight, since they were price competitive (the route is heavily competed directly with Air France, and indirectly with Air Mauritius offering service to Port Louis with connecting flights back over to Réunion). One of the interesting things about Air Austral is that one of the ways they’ve tried stay competitive with Air France with the food (Air France isn’t exactly known for their food). On the way there, we had the option of getting to pick a meal from their upgraded meal list (which turned out to cost $11 after conversion). The two most attractive options were the “Menu Marine” (Fish) and the “Menu Creole” (Réunionnaise Creole). We ended up choosing the latter, since while I can usually shrug off my mild seafood allergies, deliberately scoffing at them usually gets me in trouble. But shortly after our flight had established itself at cruising altitude, the flight attendants quickly showed up with our upgraded in-flight meals. As a result, I took what is probably the worst food photography I’ve ever had on this blog; the lighting was incredibly lousy, and I didn’t want to bother with either my dSLR or my backup camera. And it’s not necessarily the most photogenic meal I’ve had, either, instead looking a bit like most airline food. A creole-style Carri Crevettes, with a really rich and powerful (but not hot, see above) cumin and coriander sauce. 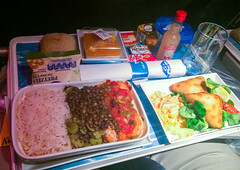 This dish was particularly notable since the shrimp was actually cooked perfectly, unusual for airline food. This was my first meal of my entire trip that purported to be authentic Réunion food, and it didn’t disappoint. It actually served as a good, enjoyable, and reasonably authentic introduction to a new cuisine. So while I’m not used to reviewing airline food here, I’ll have to chalk this one up as a success. Enough so that we similarly indulged in the same meal upgrade on the return trip (a meal that consisted of a cod carri and chou chou frittata, also an enjoyable meal). (Closed) I’ve always had a fascination for old diners. And small restaurants with very small seating areas. So when I happen across a gem like Dot’s Diner in Bisbee, Arizona, it’s obligatory that I stop in and check it out. Dot’s is an authentic Valentine Diner care, originally built in Kansas bu the Valentine Manufacturing Company in Wichita. According to the literature they’ve got as a diner, Dot’s started life as a burger diner in Los Angeles before being purchased in the mid-90s and moved to it’s current location in the Shady Dell RV Park in Bisbee in 1997, with Dot at the grill.